If you wish to do recordings and/or live performances, you will also need a microphone. Below is a common configuration. As described in the diagram, the synthesizer output gets amplified by the power amp and is directed to the talkbox. This sound is then carried over to the mouth via a tube and by changing the shape of your mouth, you would hear an effect as if you are actually singing. The microphone then captures the sound filtered by the mouth. If you wish to use a talkbox with a built-in power amp like Banshee from Rocktron, you could have an even simpler setup requiring only the synthesizer and the Banshee. If you would describe this as a singer, the synthesizer would be replaced as the “color” and “pitch” of the voice, and “the song” would be controlled by lipsinking the song. Thus, even if you may not have great pitch, anyone can carry out a tune by playing the synth and learning how to alter the shape of your mouth. What is inside a talkbox? 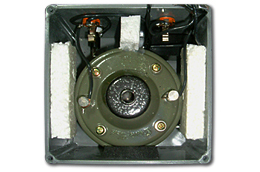 The mechanism of a talkbox is very simple, made out from just a mid-range compression driver (speaker) and a crossover. In other words, talkbox = a speaker. The compression driver converts the synthesizer signal to sound, and the tube connected to the compression driver carries the sound to the mouth. You wouldn't even need the exterior box if you connect the tube directly to the compression driver. Talkboxes are made assuming guitarists would play on it, thus a foot switch to bypass straight to the guitar amp is also included in the package.